There are certain perks in having an addiction to bikes, chief amongst which is also the simplest. On a crisp, clear Sunday morning you can hop on your bike, head into the hills with good friends and just while away the hours. This happened. And it was good. Excused from my usual weekend cake selling duties, I abandoned Karen at the market and with the bike on the roof of the car, I picked up Spanner Monkey and novice fat bike rider Sylwia along with her super-shiny, almost-never-been-ridden Salsa Mukluk and together we headed for Hollingworth Lake where we met up with Rich & Shona before setting off in search of adventure on t’ Pennine Bridleway. As is often the way with such things, the deceptively flat trail began rising and rising and rising. Soon enough I was in the granny ring, grinding out the relentless climb as Sylwia suffered with her mahoosive tyres and Rich & Shona made an utter mockery of us both by storming up the hill on their single speeds like it was nothing at all. The fleet was certainly turning heads. 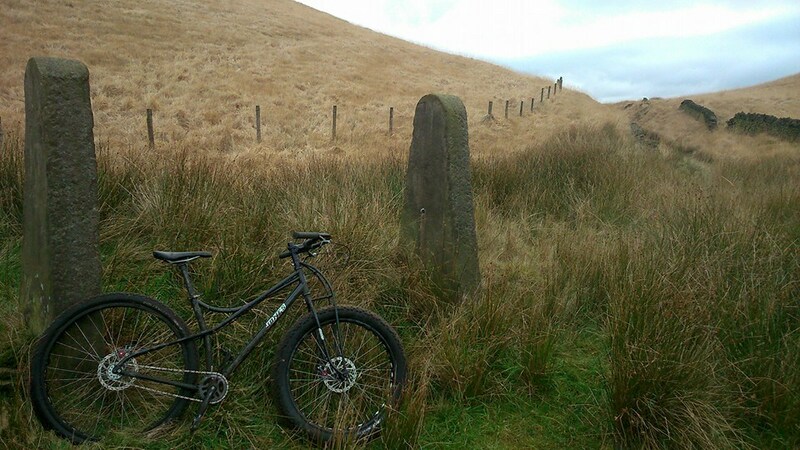 I was riding my Surly Troll in its usual off-road setup with suspension fork and less than ideal tyres. 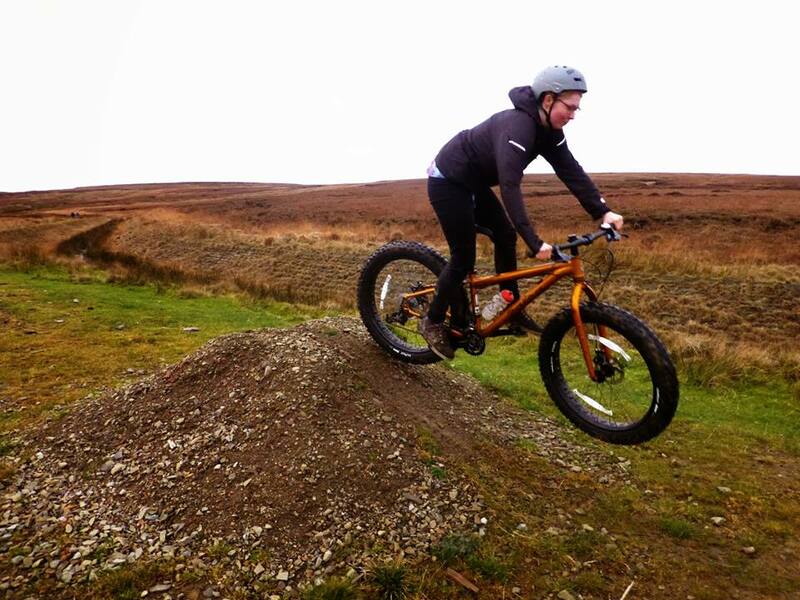 Sylwia was tearing up the trail with her brand spangley new burnt orange Salsa Mukluk, Shona was rocking a beautiful titanium something-or-other with flat bars, hydraulic disc brakes and well, not a lot else. And Rich? Well, despite striking a rather camp pose, Rich had brought along a steel Jeff Jones Spaceframe & Truss fork. 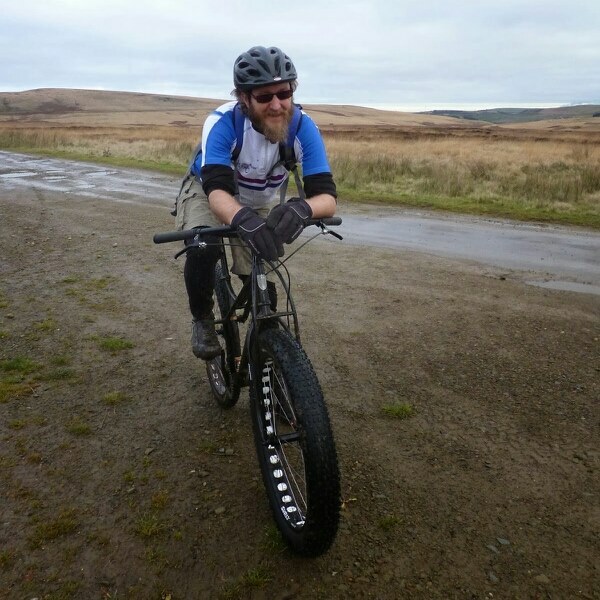 Set up ‘half fat’, the Jones was running a 29″ wheel in the rear wrapped in (I think) a Surly Knard tyre and up front was a true fat bike wheel & tyre. The awesome stopping power was delivered by Avid BB7 mechanical disc brakes and minimalist Paul brake levers. 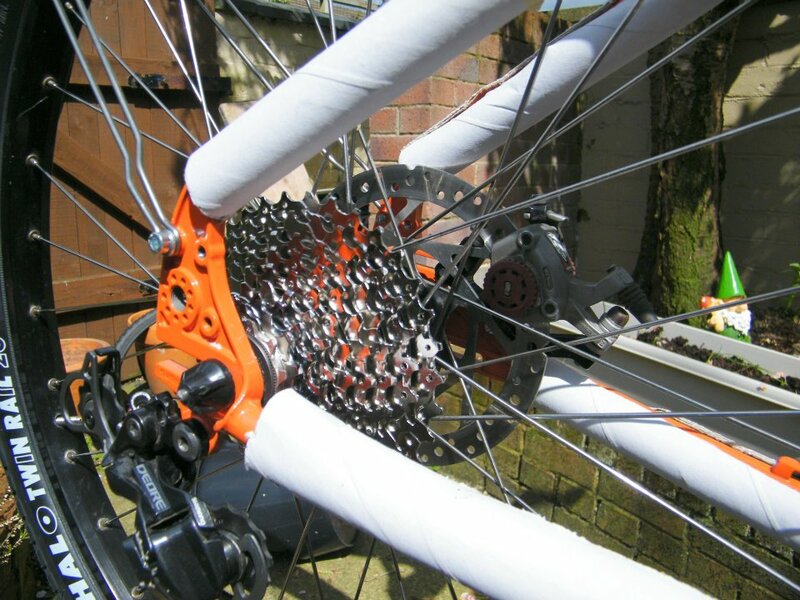 The drivetrain couldn’t have been simpler: one ring up front and one at the back with a chain inbetween. And the bars? Jones Loop Bars of course. And then it happened. As a red faced Sylwia got her breath back and I cursed my lousy tyres, Rich came over and nicked my Troll. Git. As I watched him pedal away, tyres hopelessly skidding in the deep slimy mud, I threw my leg over the Jones and pointed it towards the horizon. It took me a while to get used to the relatively tall front end and what I thought was a bizarre saddle angle, but a few hundred metres later and I was settling in. Maybe it wasn’t the right size frame for me but I did find the whole thing a little bit short in the top tube and for my taste, I would’ve liked a couple less spacers under the stem. That said, the Loop Bars have never made more sense; on the Troll they still feel super wide but they fit the Jones perfectly. On a short road section I could even get down into the elusive beard-resting-on-the-bars aero position. I tend to agree. The bike felt responsive, sharp and direct but not harsh or jarring, even on the really rough stuff. The full effort my puny thigh muscles put into the pedals was instantly delivered to the rear wheel and, even with that gigantic tyre, the front end felt precise and controllable. Before long and we turned onto a steep gravel climb. Once again Shona & Rich took off and monstered their way to the top as Sylwia and I took turns losing traction, losing balance, running out of strength and running out of talent. I couldn’t tell you what the gear ratio was on the Jones but for me in that moment on that climb it was just that little bit too tall. Getting out of the saddle and giving it everything I had, I managed to lumber the bike up to speed and get enough momentum together to keep going until I hit the next patch of gravel or fell into the next rut or was forced to stop for breath. Eventually Sylwia gave up and started pushing but not before singing ‘The Final Countdown’ by Europe to me as I nommed half an emergency banana and gave it every little bit I had left to crest the hill. Despite being so high, that was the low point. After the climb came the flat. And with the flat came a narrow track on a ridge, mossy drystone wall to my left and jeebus-that’d-hurt-if-I-fell-down-it drop to my right. “Don’t you have any proper mud tyres?? ?” Rich complained from behind me as the Troll refused to grip anything. “I’ve got some mud tyres. I’ll give you the damn things if you promise never to lend me this bike with these tyres on again!!!”. Then, as some kind of sick punishment, I finished sniggering about the awesome mud-shedding ability of the tyres on the Jones and the front wheel snatched in a rut, throwing me and the bike towards the perilous drop. Somehow, some way, the thick tufts of grass managed to catch the bike and break the worst of my fall. Clinging on for dear life and listening to Rich laughing at me I realised just how close I came to a really horrible accident. With that unpleasantness out of the way, we stopped for some emergency chocolate, a photo opportunity and some downright childish jumping over a mound of earth. Seeing just how much fun Sylwia was having, I simply couldn’t resist taking her up on her offer to swap bikes. So, I handed over the Jones, watched Rich skid all over the trail and embarked on my first true fat bike ride ever. Like finding a worm in your half eaten apple. Like realising there’s a spider creeping up your arm. Like a rodeo bull throwing a cowboy across the arena. For reasons that escape me, Sylwia’s Mukluk suddenly realised some big hairy guy was riding her and she threw me to the ground in spectacular style. Gracefully, the Mukluk executed a perfect landing next to me and just sat there laughing at my misfortune along with my so-called friends and the walkers on the trail. Oddly enough, Sylwia came and rescued the Mukluk, Rich rescued the Jones and I was reunited with my Troll for the final stretch of the ride. Bruised and battered, I gingerly made my way down the trail only to find Shona stopped and off her bike (this almost never happens); turns out the Mukluk had struck again and thrown Sylwia into some rocks. Luckily she escaped with only minor cuts and bruises but it was a healthy reminder of just how careful you need to be on unpredictable trails (no matter how big your tyres are). 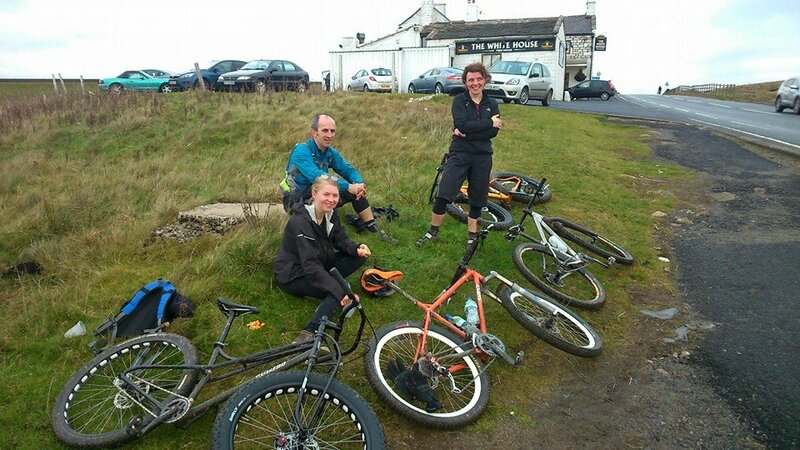 We all struggled with the last section, even Rich had to put a foot down as the Jones sunk into a bog but we all made it safely back to Hollingworth Lake, heralded down the final super fast descent by Sylwia crowing like a demented cockerel. Bless. You know when your face hurts from smiling and laughing so much? Yep, it was one of those days. I’m a bit of a perfectionist, me. Regular readers of this blog will know that several weeks ago, I collected my Surly Troll frameset from the shop with grand ideas of getting it built within a mere couple of days. I mean, given you have the parts and everything goes according to plan, there’s no reason at all why you can’t put a bike together in a mere couple of hours. I thought I had all the parts. I thought everything would go according to plan. You see, I actually did have all the parts I needed to make a perfectly usable bike; the problem is my bloody perfectionism! I already have a perfectly usable bike… in fact, if you ask my girlfriend, she’ll tell you I have several perfectly usable bikes. And, I suppose she’s right. But, the Troll was never going to just be usable. Over the years, I’ve tried and tested all manner of different parts, ridden all manner of different frame types & materials and, along the way, I’ve made my fair share of mistakes, learnt a lot of lessons and developed a fondness and brand loyalty for some of the better stuff I’ve come across. My good friend Geordie was right when he said he’d planted the Surly seed back when we built his Long Haul Trucker in my driveway. Sure, it wasn’t cheap and no, it still isn’t fully finished off so I’ll be parting with more hard earned cash before too long but (coming in on the right side of £1000) I fully expect to be keeping this bike for an extremely long time. Frame and fork – Courtesy of Surly, of course, and made from 4130 chromoly steel providing stiffness, flexibility, comfort and surprisingly low weight. Being a company that builds weird, quirky and sometimes utterly ridiculous stuff, they occupy that special place in my heart. I must put my hands up and admit I was convinced Surly was an English brand but I’m reliably informed that they are, in fact, as American as… well, Minnesota. Not to worry, we like Americans. Headset – Cane Creek. Another American brand here; they make great stuff that works well and won’t cost the earth. Oh, and they put lizards on almost everything they make. We also like lizards. 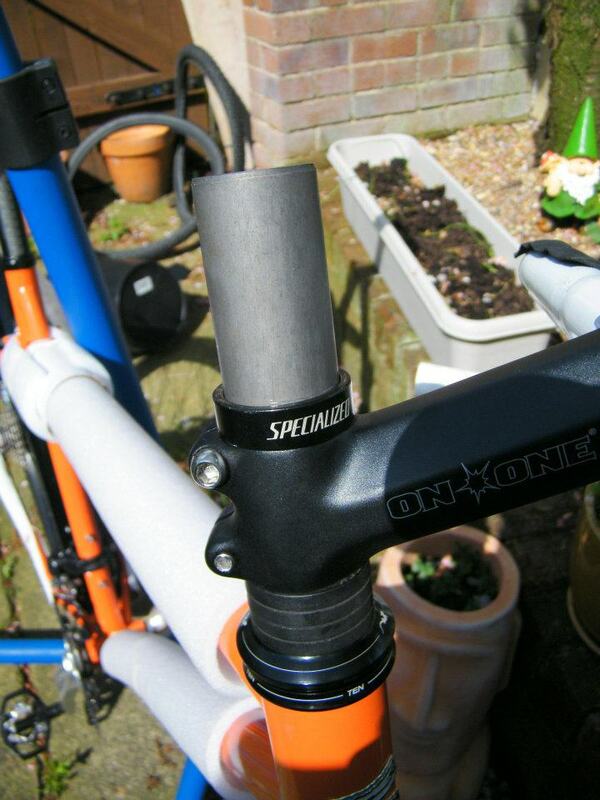 Bars, stem & seatpost – All brought to you by the good people over at On One Bikes in Rotherham. These guys actually are English and, like Surly, are also the good kind of mad. They make quirky, but well thought out stuff from good materials and it’s all available at really good prices. 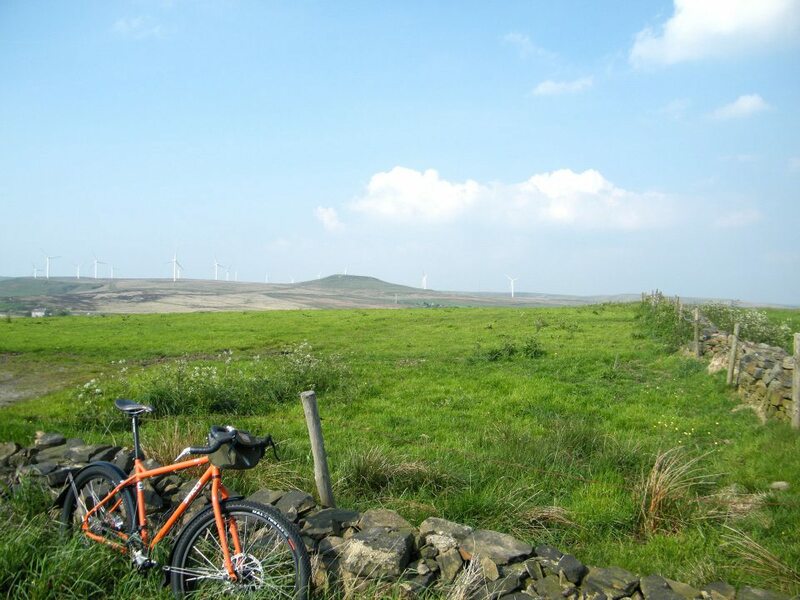 Saddle & bar tape – Another excellent English company going by the name of Charge. Primarily, they’re known these days for catering to the single speed and fixed gear market with some really cool parts, just the right amount of quirk and really good prices. I run Charge saddles on all of my bikes and have used many of their other products on several bike builds. Tyres – Halo Twin Rail. Quite simply the most versatile tyre I’ve ever come across. They do it all: road, trail, gravel and even a certain amount of mud. Originally designed for jumping around the skate park and random bits of city centre street furniture, you can now get Twin Rails in all kinds of sizes and colours. Love ’em. Oh, and Halo just happens to be another English company… sweet. Gears – Dia Compe full friction bar end levers coupled with Shimano Deore Shadow derailleurs give me all the gear combinations I’m ever going to need on this bike and all the fine adjustment that only non-indexed gear levers can give. Brakes – One more American brand creeps in here in the shape of Avid (or SRAM, or whatever they’re called at the moment) and their phenomenally good BB5 disc calipers. These are the road version and I have 160mm on the rear (the maximum possible with the Troll frame) and a massive 203mm on the front which have simply incredible stopping power – so much so I nearly threw myself over the bars on a tricky descent earlier on. The levers are Cane Creek again, SCR-5 is the model and they’re all black and they’ve got the all important lizards on them! Chainset & bottom bracket – Surprisingly enough, what with my best friend being Canadian and all the best mountian bike stuff coming out of Canada, this is the only bit of Canadiana on the bike, brought to you by Race Face. Look ’em up, they just make good stuff. As I said, there’s still more work to do here; not least switching out the rear Shimano disc for an Avid one (there’s that pesky perfectionism again), sourcing and fitting luggage racks and bags and deciding on a chainstay protector… Oh, will it never end??? So, once all of that is sorted, I’ll take some arty detail shots of the completed build but, for now, you’ll just have to make do with this one of the Troll taking a much needed rest after climbing the affectionately named ‘Hill of death’ (also known as Ashworth Road, Rochdale). The descent of which is quite simply awesome, by the way. Part of me always knew the Troll wouldn’t be put together in just a couple of days. I was optimistic that maybe, just maybe, everything would just bolt together and work perfectly; alas, that’s just not the way with custom bikes. Particularly if you’re obsessive about these things; like I am. One of the things that has gone well with the 2nd stage of the build: The new 11-34 Shimano Deore cassette arrived and looks great with the 160mm disc on the other side of the rear hub and, now the rear wheel is in the frame, I see no good reason why it needs to come out again in the foreseeable future. Oh, by the way, if you’re planning your own Surly Troll (or Ogre) build with full wrap mudguards, you’ll need to undo the lower mudguard mounts to be able to get the wheel out thanks to those horizontal ‘dropouts’. 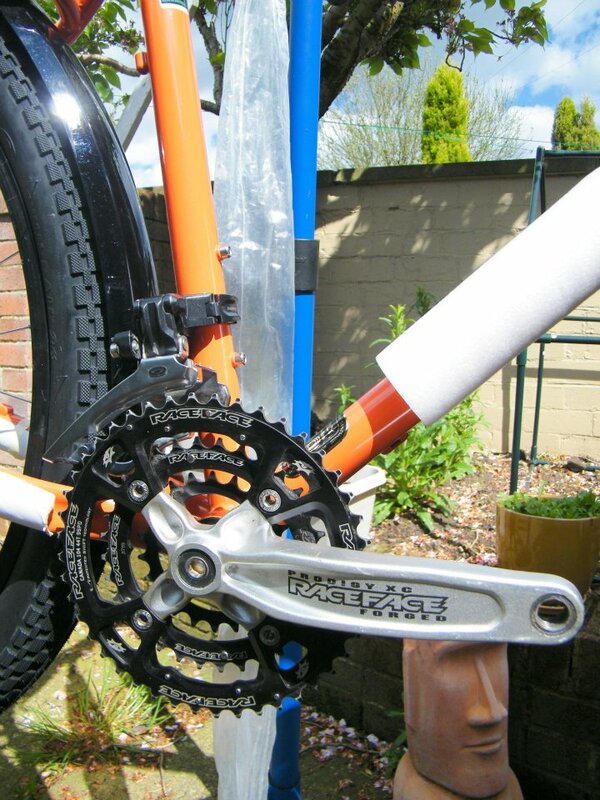 Also working out beautifully was the installation of the bottom bracket and chainset. I had these lying around from a previous mountain bike build and, quite frankly, I just love them. I remember the Race Face bottom bracket setting me back £60 once upon a time and, do you know what, it was worth every single penny. The chainset with gorgeous Race Face chainrings was an eBay bargain and, despite the overall colour scheme being orange and black, I think the silver crank arms actually look really nice. Front & rear derailleurs are brought to you by the Shimano Deore Shadow range and fit really neatly to the frame with some rather clever cable routing designed to avoid bits of trailside foliage, small children and the like from getting caught as you ride along. Again, these were lying around from the aforementioned mountain bike which just happened to have a different diameter seat tube than the Surly. Do I still have the correct shims for fitting the front derailleur? Of course I don’t! Happily, Rich over at Keep Pedalling had the ones I needed lying around in his parts box. 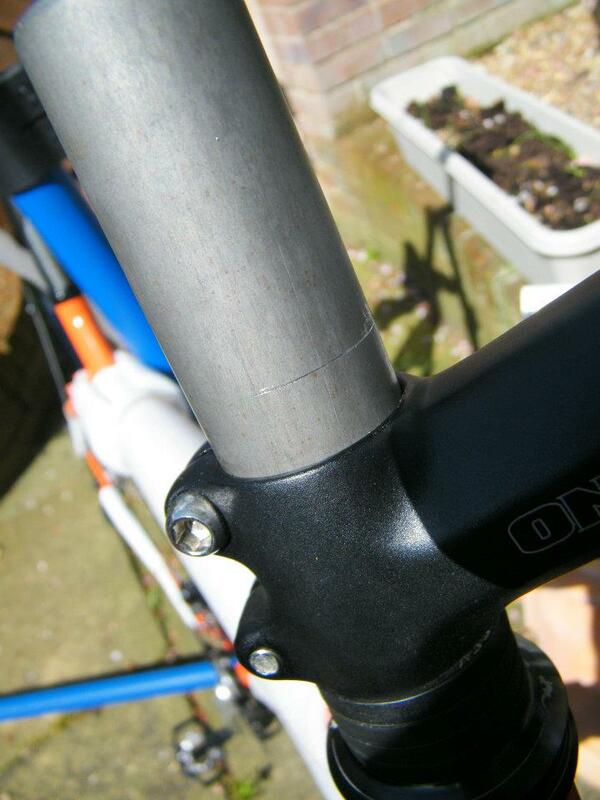 Next up is the dreaded job of cutting the steerer tube down to length. Now, this is a job that really shouldn’t be attempted if you don’t have the right tools, the right knowledge or a large pair of balls; once you’ve cut it off, you’ll struggle to stick it back on again so my advice here is to always, ALWAYS err on the side of caution and leave more than you need because you can always take a little more off if you need to. For me, that meant 20mm of spacers below the stem and then an additional 10mm spacer above the stem to give me a little bit of tolerance (even though I knew full well I’d never need it). So, once you have all your spacers and stem in place and you’re confident the headset is nicely seated against the crown race, mark the steerer tube above the upper spacer with a sharp flat-bladed screwdriver or something similar to give you a line to cut to. 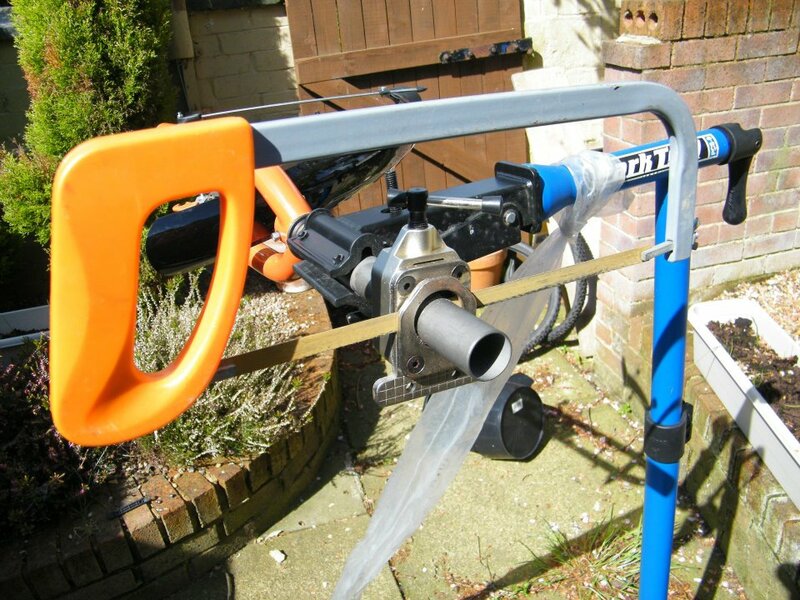 And, as the great Norm Abram would say “Measure twice, cut once”. With the upper spacer removed, you can see the litte mark left by the screwdriver blade. Removing the wheel from the fork, the fork from the frame and putting all the little loose bits of the headset somewhere clean, I lined up my specialist saw clamp against the mark I’d made and then wriggled it down the steerer about 3mm; the reason for this is that you don’t want your top cap resting on the the very top of the cut steerer, rather you want about a 3mm gap. More on all that in a dedicated ‘How to…’ blog entry a bit later on. And so, the moment of truth. With that little bit of excess steerer tuibe cut off and the star fangled nut installed (another ‘How to…’ blog entry and more specialist tools required here), I went ahead and cannibalised my poor old Merida for its bars, stem and shifters. Now, I know what you’re thinking: drop bars, bar end shifters, mountain bike gearing, disc brakes and fat road tyres??? Well, yes. Surly has never been conventional and neither have I. Have a little faith, it’s all going to work. I think. 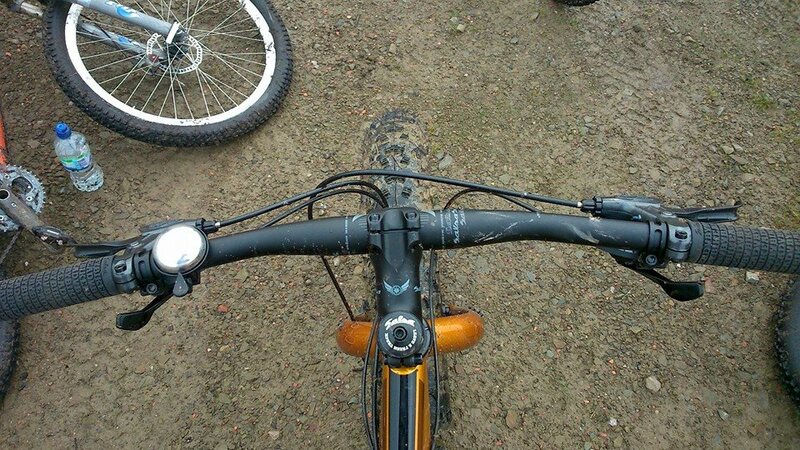 Now, the reason why this blog entry isn’t ending up with the fully completed bike is simply down to the brakes. Like the derailleurs and chainset, the Avid BBDB (precursor of the legendary BB7) calipers came from my old mountain bike and are, sadly, shot. Which means the Cane Creek Drop V brake levers which were eye-wateringly expensive are about as useful as a chocolate fireguard. Cue another not-so-good-for-my-mental-state 5 minutes. Ah well, that’s custom bikes for you. The solution: I bagged a pair of Avid BB5 Road calipers for… well, a less eye-watering price which are winging their way from the US as we speak. What this means for the rather sad looking Merida is that it’ll also now be losing its Cane Creek SCR-5 brake levers too and I’ve decided to go completely off the wall and fit a massive 203mm disc to the fork (also winging its way as we speak) so I should be able to throw myself (and probably a fully loaded BOB Yak) over the bars with the application of just 2 fingers. Yay! Those of you who know me well also know that there are precious few things in life which make me grin like an idiot and giggle like a schoolgirl; chief amongst which is, of course, the prospect of laying my hands on some new cycling related shiny. You see, for a while now I have been coveting another… I love my Merida dearly, it takes me just about everywhere I need / want to go; often with Kojak attached, filled with god knows what. Before that, I also loved my Graham Weigh cyclocross which is currently broken down in boxes waiting for me to decide what on earth to do with it. They’re both up for sale but I also have a very soft spot for my Coventry Eagle and Falcon Panther. But, something has always been missing… it’s hard to explain what but there was definitely something. And so, after much research, a lot of saving up and an awful lot of time spent drooling over one in the bike shop, I am ridiculously happy to report that I shall very shortly be ordering myself a Surly Troll! Do a quick Google Images search and you’ll see several custom builds, some of which are pretty cool and some others which are… not. A fellow blogger has done quite a good job on his Troll but I think I’m going to go in a slightly different direction. I’m lucky enough to have an awesome bike shop at my fingertips which just happens to have a ready built Troll in stock which just happens to be exactly the right size for me so this weekend (my girlfriend has gone away for a few days) I popped into the shop, bribed them with some shortbread from the excellent Blue Daisy Cafe around the corner and took the Troll out for a spin around Manchester’s Northern Quarter. The complete bike comes with a rather odd selection of parts including some very wide handlebars, Avid disc brakes, Kenda tyres and a rather cheap and nasty WTB saddle. The Shimano Deore 27 speed mountain bike drivetrain suits the 26″ wheels and the setup of the bike very nicely and the all steel frame and fork are surprisingly light. The major attraction for me is the incredible versatility of the bike; it’ll take just about any drivetrain you want to fit from single speed to internally geared Rohloff hub and everything inbetween. You can run disc brakes or cantis (even v-brakes if you really must), flat bars, road bars or… any bars you like – some suggestions here. Unlike many other frames, you can also fit disc brakes, full wrap mudguards and pannier racks (front and rear) all at the same time with no interference issues and, if all that wasn’t enough, there are also dedicated mounts for Surly and BOB trailers! 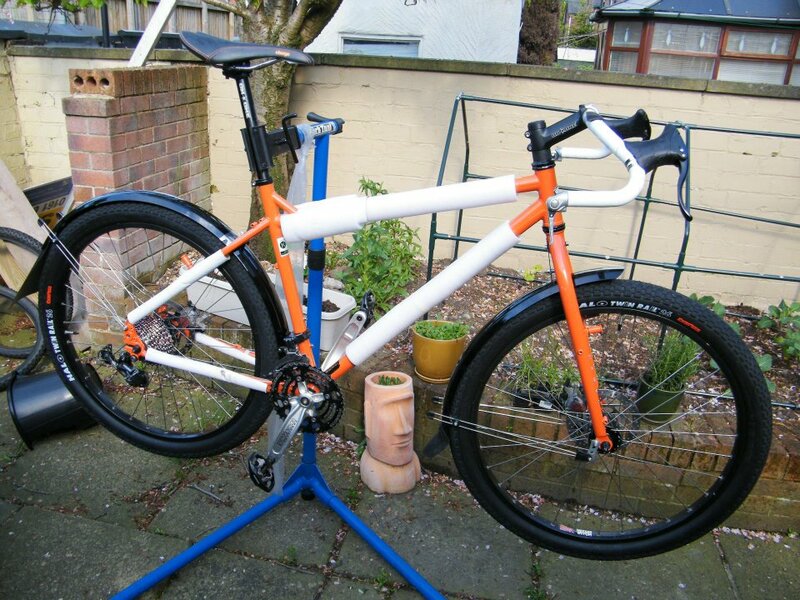 As I want my Troll to be a commuter, tourer and ocassional weekend trail runner, I’ll also be fitting full wrap mudguards (just as soon as I can find some wide enough to cover the tyres!) and front and rear pannier racks too. Keep your eyes peeled for progress reports – I’ll be ordering the frameset and other parts tomorrow!! !